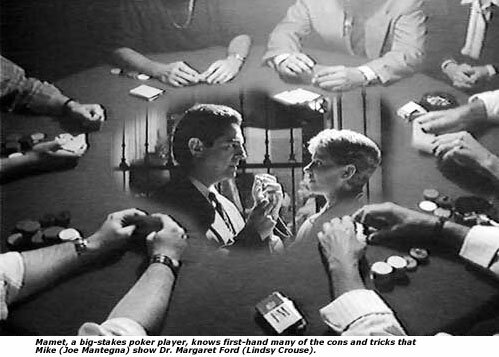 House of Games is the first film directed by playwright David Mamet. A riveting psychological thriller, laden with crisp and suggestive Mamet dialogue, it keeps the viewer surprised at every turn while deftly exploring prominent psychiatrist and best-selling author Dr. Margaret Ford's (Lindsay Crouse) introduction intoto use Jungian terminologythe shadow side of life and her own shadow. Trying to help a desperate patient, Ford seeks out a con man named Mike (Joe Mantegna) and, attracted to him, becomes intrigued with how he fleeces people. With her short-cropped blonde hair, tailored business suits and professional manner, Dr. Ford projects the epitome of the knowledgeable therapist. This knowledge, however, is only textbook deep. Like so many drawn to the practice of psychology, her need is to be in control of emotionsher own and those of others. That her name is Margaret and she is, Faust-like, striking a deal with the devil never occurs to her nor does Mamet hint at it, but the character of Margaret in Goethe's archetypal play Faust is a connection to consider (it is as if she, the modern emancipated woman, has supplanted Faust in his quest for absolute knowledge). While Margaret observes, Mike introduces her to the world of con games and the rules that govern them. Con artists, Margaret learns, enjoy manipulating, keeping control, succeeding, just as therapists do. It's part of their m.o. Conning people out of their moneyplaying on their greed, spoon-feeding them a diet of lies and illusionsis the essence of the game. There's no remorse. In fact, there is glee. If the con financially destroys people, well, they had it coming. Only at murder does the con artist draw the line. When Margaret protests his actions, Mike tells her"You say I acted atrociously, yes I did. I do it for a living." His honesty is quite direct and sincere. He knows what he is and has accepted it. This gives him a strength and depth Margaret has still to integrate. Mamet, a professional poker player, keen observer and himself a creator of illusions, knows the world of the con artist well. So Margaret, and the viewer, learn a great deal. For example, the "tell." Everyone has a "tell." It surfaces at the pressure point when tension is at its extreme pitch. It's some small, usually unnoticed manifestationa tapping finger, a squint, a half-pronounced wordthat reveals what's beneath the surface, where the dupe is really coming from. Mike also tells her that when something goes wrong, when you are fired from your job for instance, you should take something that belongs to that person or company. That puts some chips back on your side. In other words, you are no longer passive but active. This is the key to the film's last scene.